Rosaria, Mother of Rebirth is here. Deacons of the Deep are the boss. Of the Archdeacons of the Deep, one attended to Rosaria,Mother of Rebirth,whom he deemed a goddess. Massive iron armor worn by knights serving the Cathedral of the Deep. Ultra greatsword wielded by the knights of the Cathedral of the Deep. Highly destructive if intolerably heavy. Its blade is flattened for use as a strike weapon, but the point at the end allows for thrusting. A heavy iron shield used by the knights of the Cathedral of the Deep. The blessings of the Cathedral have granted it high dark absorption. The face of the shield is decorated with the emblem of an old king of Lothric: a bold image of a great bird gazing skywards. A ring bestowed upon the Deacons of the Cathedral of the Deep. Allows attunement of additional spells. In the Cathedral slumber things most terrible, and as such, the deacons require a grand narrative, to ensure they do not falter in their duty. A philosophy, to ward away the madness beckoned by the grotesqueries at hand. Miracle taught to inaugurated deacons of the Cathedral of the Deep. Slightly boosts attack, damage absorption and resistance, while also increasing stamina recovery speed. The deep was originally a peaceful and sacred place, but became the final rest for many abhorrent things. This tale of the Deep offers protection for those who worship amidst those horrors. The holy symbol of the Cathedral of the Deep, and crest of those who see beyond fire to the age of deep waters. Equip to pledge onself to the Aldrich Faithful covenant. 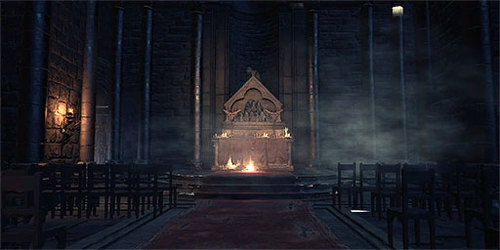 The faithful ensure that Aldrich, Devourer of Gods, remains undisturbed, by taking the form of loyal spirits and hunting down those who would trespass the ruined cathedral. Summoning takes place automatically while this is equipped. A malformed ring left by Aldrich, Saint of the Deep. Recovers HP from critical attacks. A malformed ring left by Aldrich, Saint of the Deep. Recovers FP from critical attacks. Aldrich, infamous for his appetite for flesh, apparently had the desire to share with others his joy of imbibing the final shudders of life while luxuriating in his victim's screams. A gem of infused titanite. Found in the dregs of the Cathedral of the deep. Used in infusion to create deep weapons. Deep weapons inflict dark damage, but lose scaling effects. There is a darkness that lies beyond human ken. A skull resplendent in the scent of souls. Prepared by evangelists of the Cathedral of the Deep. Throw to shatter, spreading souls which attract enemies. Not effective for all foes. Medicinal pellet made from crushed insects. The red type temporarily boosts fire damage absorption. Prepared in the Cathedral of the Deep by evangelists, who dole them out to followers to ease their suffering when they burn. A braille divine tome of the Deep, belonging to the deacons of the cathedral. Intended to teach divine protection to the deacons of the deep, but later, dark tales were added to its pages, such that it is now considered a thing profane. Defeat the Host of Embers of the world you have invaded to gain the strength of fire. The red eye orb is rooted in a tiny land swallowed by darkness long ago. Some choose to put the orb to other uses. 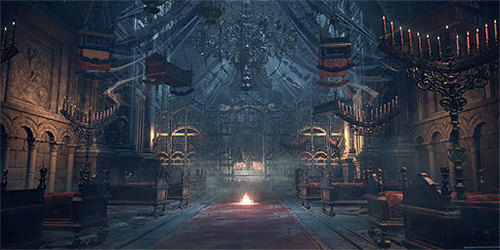 To embark on this path, enter the service of Rosaria in the Cathedral of the Deep. Small silverwork doll depicting a young squire. In the legendary old city of Irithyll situated in the Boreal Valley, the Pontiff Sulyvahn gave this doll to valued subjects, so that they might use it to cross the barrier when they return home. Listen carefully, and you can hear it say, "Wherever you go, the moon still sets in Irithyll. Wherever you may be, Irithyll is your home.